Macron (left) will work to strengthen the EU. Le Pen will push to leave the bloc. PARIS -- Voters in France go to the polls on Sunday in a presidential election that no matter who wins could have repercussions for the country's automakers, Renault and PSA Group, both of which are partly government-owned. 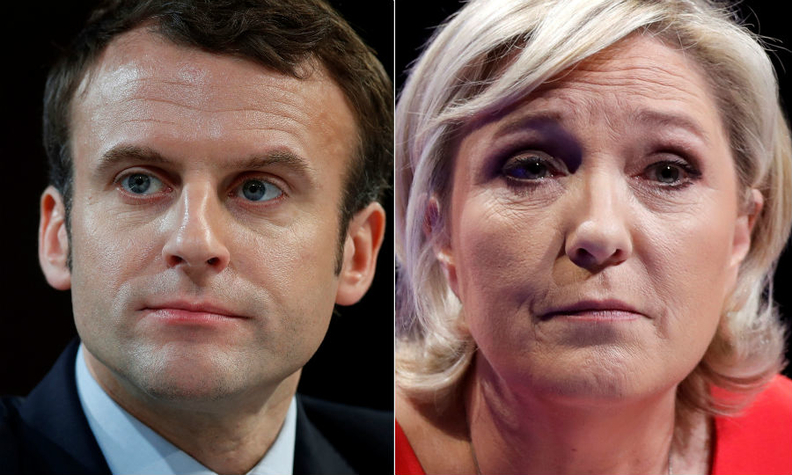 The first round of voting on April 23 whittled a field of 11 fractious candidates down to two: The front-runner, Emmanuel Macron, an independent centrist who says a reform of France's labor-friendly work rules is necessary to shake the country out of its economic doldrums; and Marine Le Pen, the leader of the far-right National Front who has vowed to protect French workers by pushing France to leave the European Union and abandon the euro currency, though she has moderated her positions in recent weeks. Macron, 39, who served briefly as President Francois Hollande's economy minister, has about a 20-point edge in opinion polls, but his lead over Le Pen, 48, has narrowed considerably in recent weeks. A substantial part of the electorate remains undecided, however, and many on the far left say they will sit out the vote. Le Pen's campaign has stoked fears over immigration, terrorism and globalization, echoing themes that led to the UK's vote to quit the EU and the election of President Trump in the U.S. She has a strong power base in the "rust belt" of northern France, where unemployment is well above the national average of 10 percent. Her proposals would increase border tariffs and labor protections, including allowing workers to retire at age 60. Those policies would most likely pose problems for French automakers, who are already grappling with high domestic labor costs and foreign exchange headwinds from a weak British pound, experts and analysts said. "She will learn pretty quickly, with PSA just having taken over Opel, that it's not in her interest to be protectionist in France, because the Germans will do the same thing," said Daniel Gros, the director of the Center for European Policy Studies, a think tank in Brussels. In contrast, Macron promises to work to strengthen the EU, cut about 120,000 government jobs and slim down France's notoriously plush welfare state. His proposals come as both Renault and PSA are diversifying. Under CEO Carlos Tavares, PSA is in the process of buying Opel/Vauxhall from General Motors, adding German and British brands and production facilities. The Renault Group now sells 45 percent of its vehicles outside of Europe. "The French automakers are globally oriented so it's very difficult to protect the 'old country,'" said Martin Benecke, manager of light vehicle sales forecasting at IHS Markit. "The companies are not just connected to France. They are really international with joint ventures, now with Opel on board at PSA. It's not realistic to go back to protectionism." Auto industry groups in both France and Germany have issued statements in support of Macron's platform. "We are in favor of free trade, pro-Europe policies and less taxes on salaries and production," the French automobile industry association, or CCFA, said on Wednesday. "The pressure is increasing on the French system to liberalize," Benecke said. "They have to do it anyway, from my point of view, but better to start now than in 10 years when everything is broken. "It's difficult to really compete with other countries and other regions if you keep on with these strict laws," Benecke said. Macron has a complicated history with Renault. In 2015, as economic minister, he directed the French government to raise its stake in the company to nearly 20 percent from 15 percent. The move, a rare defeat for Renault CEO Carlos Ghosn, ensured that long-term investors -- including the government -- would have double voting rights. The government holds two seats on Renault's governing board. At the time, Macron said the purchase reflected the Hollande government's determination to use all available tools "to promote a progressive, long-term kind of capitalism that supports workers and helps companies grow." The increase was described as temporary, but two years later the French state still has not reduced its share. That has rankled Ghosn, who this year said that Renault and its Japanese partner, Nissan, could not consider further integration unless the French government sells its share. Under the terms of their 2002 alliance, Renault holds 43 percent of Nissan with voting rights; Nissan holds 15 percent of Renault, but without voting rights. "The day the French state decides to get out, everything is open, and I can tell you it won't take too much time," Ghosn said. Renault was criticized by Macron over Ghosn's compensation, after a nonbinding vote by shareholders voted to reject the executive’s $8.3 million payout in 2015. The vote was overturned by the company's board, leading Macron to complain about Renault's "dysfunctional governance" and threaten legislation to restrict pay. PSA, too, has not been immune from Macron's criticism. When CEO Carlos Tavares' salary was doubled in 2015 to 5.2 million euros, Macron described it as "excessive" though he noted Tavares was a good manager in the midst of turning around a struggling company. That recovery was aided in 2014 by an infusion of capital from the French government giving it a 14 percent stake, though Macron was an aide to Hollande at the time and had not yet been appointed economy minister. Macron has promised to sell some of the government's asset portfolio to raise money for an innovation fund. PSA shares, having risen sharply in value as Tavares has revived the company's fortunes, could be an attractive target. Gros expressed some skepticism that Macron would follow through if elected. "It's easier to say that in opposition than when you are in government and you enjoy the patronage and ability to have influence," he said.